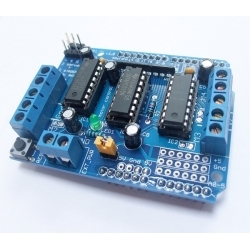 A Motor driver shield for Arduino boards that can control up to 4 bi-directional DC motors with individual 8-bit speed selection, or 2 stepper motors (unipolar or bipolar) with single coil, double coil, interleaved or micro-stepping. 2 connections for 5V 'hobby' servos connected to the Arduino's high-resolution dedicated timer - no jitter! To increase the maximum current, the L293D allows extra chips with "piggyback". 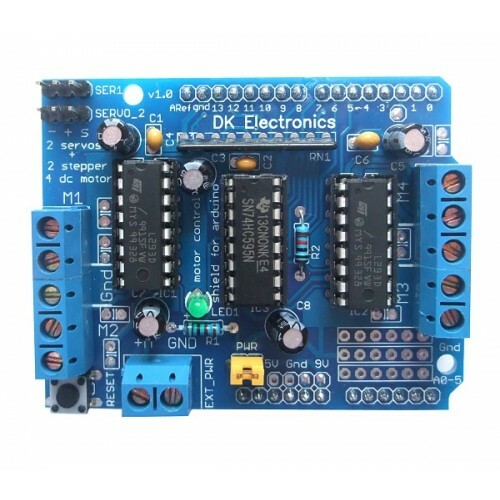 Piggyback is soldering one or two or three extra L293D drivers on top of the L293D drivers on the board to increase the maximum current. The L293D allows parallel operation. 2x 5V Servo outputs connected to the high-resolution dedicated timer - no jitter! 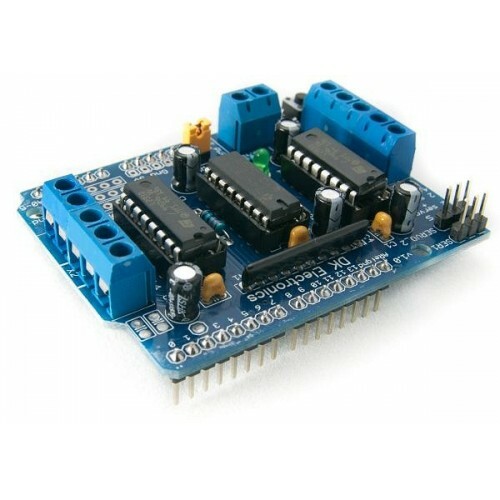 Power for the motors can be supplied from the Arduino boards DC Jack (normally 9V) or from the 2-pin EXT-PWR terminal block. 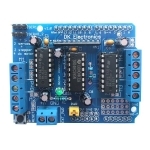 If you are supplying power from the EXT_PWR terminal block you should remove the PWR jumper or you could damage the shield and the Arduino board.